Artificial Brain Ten Years Away? How Powerful were the Apollo Computers? Days of the Logo Numbered? Have now followed the commercial application of RFID tagging for years. I am particularly interested in the analytics used to leverage data from RFID sensors. We connected with work at MIT and U of Arkansas that determined the relationship between tagging and increased retail efficiency. The RFID journal does an excellent job of providing updates of RFID tagging. Steve Genco from Lucid Systems on the Implicit Power of Packaging, Met with Steve recently and he outlined the very good work that he has been doing with clients. ' ... Neuroscience meets social science meets the marketplace ...'. There are relatively few groups that are really trying to understand the marketplace below the level of conscious decisions. Roger Dooley writes about the Coke Freestyle intelligent dispenser as a market research approach. I agree, it is a way to link research to differentiated delivery, which gathering lots of consumer behavior information along the way. The potential for business intelligence is high. Previously about this. A recent conversation at our little start-up questioned the need for press releases. Paul Gillin makes the case that a number of things that could be described as so very '1.0' still have value, including the ancient artifact known as the press release. Everyone likes the idea of having an intelligent assistant to help lead them through complex systems tasks. Yet almost no one liked Microsoft's 'clippy' idea. The sheer obtrusiveness was part of it. It then got wound up in the whole Microsoft hatred thing. In the end a cynical view that was not useful to anyone. Lots of hours wasted. Now the idea of an AI that helps is being reworked. About time. A precient view of the internet from 1969. Semantic analysis. An area of interest. In readwriteweb and in Computerworld. Google is continuing to improve search that includes semantic concepts. What does this mean? Semantics imply the meanings of words in context. Less than complete natural language understanding. You have probably seen some suggestions, at the bottom of the search page a list of searches related to ... this is a semantic reasoning which includes the concepts that can relate to the search terms. These are fairly obvious, but worth some further thought. Big news in analytics world. The article says to do better predictive analytics. In the enterprise SPSS and SAS have been heavily used since the 6os. Quite an acquisition, makes sense to strong support IBM's consulting, which most times includes an analytical component. Personally I think all useful analytics are 'predictive', unless you are trying to understand some historical changes, the only analytics that are useful are those that either predict some future state, even if that is the same as the current state. In the NYT: Lab Watches Web Surfers to See Which Ads Work. How they are using eye tracking and other biometric techiques to understand how ads work. As always draws the question about how 'looking at' an ad can determine the level of engagement and behavior. Necessary but not sufficient. Read Say Everything: How Blogging Began, What It's Becoming, and Why It Matters by Scott Rosenberg. A history of blogging to date with interpretation along the way. I have been involved with blogs, internal and outward facing in the enterprise since 2001. We initially used it to stay in touch with visitors and vendor connections for innovation centers. It worked well for that purpose. It also acted as a means for informing employees about our activity. Before that we were on the WELL and managed mailing lists. If you have followed blogging for any length of time you know many of the stories described in his book. Sometimes Rosenberg spends too much time providing detail, like about the founding of Blogger. That was more about the story of a start-up than about blogging. I do like his exploration of sincerity vs authenticity in blogs. I did learn much about stories that I followed for a while and then disconnected with. That's the value of a book versus a blog. Almost nothing is said about internal blogs, or blogs mean to be used for knowledge capture. I like the thoughts about its origins, even a suggestion that Pepys was an early blogger, though there is no evidence he was writing with any audience in mind. So overall intriguing for those with an interest in the area, though borders on the tedious for those who are not already involved. Best of all were the last several chapters that deal with blogs vs journalism and the future of blogging. They are worth reading by themselves if you don't want to know all of the history details. Scott Rosenberg also has a well known blog: Wordyard, where as expected, he updates the book. That is the value of a blog versus a book. By George Dyson in the Edge. The historian of science takes on math models of economies. A bit dense in its historical references, but makes you think. US postal service reports the largest drop in mail volume in hundreds of years. Not unexpected, but the statistics here are interesting. Paper mail, like many technological artifacts, will likely survive, but in far smaller quantities. Though Telegraph services were completely discontinued by Western Union at the end of January 2006. From HBR, Can knowledge hurt innovation? ' ... A meeting I had recently with some folks at Gillette highlighted an important issue facing the would-be innovator — the "curse of knowledge." ... '. Intriguing thought, but I don't like it. Wal-Mart is in the process of retooling its privacy policies to include mobile and online data. In Storefrontbacktalk. Where they talk about the implications. This will not make the AP popular on the Web, in the NYTimes. Though I rarely do, I will make every effort not to link to AP articles. Update: Scott Rosenberg says AP is going nuclear on this. Worked with Metro retailer on their impressive tagging efforts. Their innovation stores were a testbed for these capabilities. A report below on recent efforts and technology improvements. Near-perfect RFID reading is important, but it is not the only issue with these methods. Analytic and monitoring capabilities linked to RFID to provide value are important, as well as privacy concerns. I gave many talks on their application in our innovation centers. Good discussion of the ownership of location data in retail. In Mind Hacks: Outlines some articles and research on the psychology of crowds and the fluidity of identity. ' ... recent research shows that people tend to cooperate and quickly achieve an altruistic and bonded group identity when in large numbers ... ' . Lack of entropy apparently. Could this be applied to marketing? Is this saying that advertising is a means to create a crowd to produce order?
' ... Kyield announced today the availability of its patent-pending semantic enterprise system for license to organizations, consultants, and integrators. The advanced knowledge system is designed to substantially improve innovation and productivity throughout the organization while reducing human-caused crises. The Google latitude location sharing application is now available for the IPhone. Can't say I have ever tried this kind of location sensitive social capability, though I could see commercial applications like stock up delivery applications in retail and maintenance crew coordination. I am sure there are a number of others. Anyone know of some in use today? Update: It is important to note that this is not a native app, but a web application running on the IPhone Safari browser. Attended a talk by Don Hoffman entitled: Visual Intelligence in Marketing. He is the author of the book Visual Intelligence: How We Create What We See. The premise is how our visual system plus brain creates a best theory for the information our eyes give us. Many of the remarkable images and research that show how our seeing is theory and not fact are included. The talk emphasized how marketing can utilize these learnings. Well done. See also his home page at UC Irvine. From the TED conference: ' ... Professor Markram said he would send a hologram to talk at TED in 10 years. A detailed, functional artificial human brain can be built within the next 10 years, a leading scientist has claimed. Henry Markram, director of the Blue Brain Project, has already simulated elements of a rat brain. He told the TED Global conference in Oxford that a synthetic human brain would be of particular use finding treatments for mental illnesses.... ' . I have my doubts, there is just so much we don't know to perform this kind of engineering feat. A hologram is not an autonomous brain. More on Blue Brain. Good Piece in Knowledge@Wharton: Eyes Wide Open: Embracing Uncertainty through Scenario Planning. Given our uncertain times, a technique that needs to be more commonly used. It is perhaps the discipline that is most lacking. Large enterprises should have shelves of key scenarios that are ready for use, application and modification. Even the exercise of their application can lead to insight. Also here about creativity in companies. For more about our innovation centers and their virtualization. Interesting Google tech talk on the topic, a talk by Phillipe Goldin … useful background. At P&G we always talked about delighting the consumer, not just satisfying their needs. How do we ensure a delightful experience? Its all about understanding the emotions. I see that there is now a 256GB USB memory stick. Expensive, but things like this will drive the price of others down. Will allow us to lose increasing amounts of data easily. Be careful. In Adweek, good overview about how brands can be integrated into games on phones. This is something we examined starting a number of years ago. How do you take this beyond a simple product placement model. Mentions Nissan and Pizza Hut that have recently introduced Advergame applications on the IPhone. Have not looked at these yet, but only a handful of brands have tried this model on the IPhone. It turns out to be difficult to provide an engaging game that includes an obvious commercial link. Especially when there are so many quality, easily accessible games at small cost. Also not in the usual realm of this blog, but I am in a space mood tonight. It is clear that this kind of thing occurs more often than we thought. It also is an example how advanced we have become in imaging and image analysis. One of the things I researched in school was determining how the constant influx from natural space debris can influence atmospheres of stars and planets. Its a chaotic world out there. With the anniversary underway, its fun to consider the power of the guidance and systems computers during the Apollo days. Very primitive indeed. My phone is far more powerful. In Downloadsquad. From the Lucid Systems blog, a short look at new book by Zack Lynch and Byron Laursen called The Neuro Revolution. To be released on July 21. Looks to be interesting, will read and review here. See also Lynch's blog. I am a long time student of this topic and am now affiliated with a firm that deals with non-conscious human behavior, so you will see more about the topic here. Although a bit off the usual topic here, I find this interesting. Dogs cloned from trained dogs are being used in a drug sniffing test. If successful, this would imply that some skills can be derived from cloned mammals, with general bioengineering implications. See also the Snuppy article in the WP, which details some of this. Interesting piece on the security of social networks. And the full paper, Google authors. In Storefronbacktalk: Pennsylvania looks at self service wine kiosks with face recognition and integrated breathalyzer. I like trying new integrated kiosk sensors, but as nervous as US states are about alcohol sales, I don't think this will be approved. In Ohio you need to be over 18 to even scan alcohol at a register. Just took another look at TheBrain, a graphical means of storing and manipulating your knowledge. A form of mind-map. Jerry Michalski introduced me to it. Explored it for applications in the enterprise years ago, but was not suitable at the time. I note now that they have added a number of new useful capabilities since I looked at it last. Worth a re-look. Jerry just had a mention in the their blog. His 'brain' now has over 100,000 'thoughts'. Will Science 2.0 methods like these eliminate the need for research papers? Apparently a number of electronic books were removed remotely from Kindle book readers after they were bought and paid for. Included Orwell titles. Thats an advantage of paper books I had not thought of. Tougher to raid every house and take them away. Fahrenheit 451 turning out different than the way it was portrayed. And here. In the enterprise we discovered how difficult it was to construct all the rules to provide the capabilities required for even a narrow slice of corporate knowledge. We then experimented with a number of methods that allowed us to induce knowledge from enterprise sources. We looked at early knowledge construction methods like Cyc. That was before the Web was common. Now there are new ways to think about this, still not complete, but steps in the right direction ... Making a system learn is the ideal AI. SAS announced a new product that does social network analysis (SNA). This is something we experimented with inside the enterprise, initially with plain old e-mail. I studied packages that existed at the time. Its a powerful idea when trying to understand how ideas propagate within a company, and how creativity can be made to spread by providing the right architecture, but also can cause some concerns about privacy. Would love to learn about SAS's capabilities and their planned application. The article linked to above provides an outline of SNA.
" .. Spanish researchers have developed a computer model able to generate virtual faces which display emotions and moods according to personality traits. The team leader explains: ‘The aim of this work has been to design a model that reveals a person’s moods and displays them on a virtual face. In the same 3-D space we have integrated personality, emotions and moods, which had previously been dealt with separately.’ This model could be applied in both educational environments (virtual tutors and presenters with personality traits) and in video game characters. But read more… "
From Paul Gillin's Social Media Blog: Why Web Sites don't matter. He has some interesting points, but I disagree. I don't always want to engage with someone or their ideas. I just want the basic facts. In fact I could not possibly engage with everyone, even in some narrow contexts. Thats the reason for a web site. In the NYT, some examples of religious groups using Twitter. They make an odd kind of implied assumption that faiths are different from other interactions among people. Of course it works, you can always link outside the twitter interaction anytime you want to. And anywhere millions of people collect, marketers of any ideas should pay attention to. In AdAge, an article that makes the case that tracking benefits consumers and makes online life easier by not repeating the same message over and over. This is with the looming threats of legislation that will address targeting consumer online. Cookies started this, but it is now a much broader set of capabilities to match consumer and their needs and wants. Marketers are taking stock of possible regulations. Safeway has now expanded the use of online coupons to all of its stores. More evidence of the movement from paper to the prevalence of online promotions. Martin Lindstrom in Branding Strategy Insider blog. ' ... Let’s be frank – we live in a logo obsessed world. Pay a quick visit to Times Square and you’ll see what I mean. But is the magic still in the logo as we are exposed to some 2 million television commercials throughout life until we reach the age of 66 – or do we continue to be caught up in a format which once worked but, with the passage of time and the changed media picture, is now out of date? More details in his recent book - Buyology: Truth and Lies about Why We Buy.
' .. The Golden Ratio has been used in design for ages. Such greats as DaVinci, Michaelangelo, Rembrandt, Mondrian, and LeCorbusier utilized it in many of their works. Even Mother Nature utilizes the proportion - in nautilus shells and pine cones, for example. Actually this is quite trivial if you think of it, see the comments. Wim Van de velde sends along some other interesting sites on the topic: Furniture design, a Golden ratio site, via Wolfram, A design group and the suggestion that phi designs are inviting and calming. Update: And as seen by Disney. I know I have been harping on Wolfram Mathematica, but since I have been re-introduced to their suite and have had a chance to scan their offerings I have noticed they have a really remarkable set of demonstration projects, as of today over 5000 strong. Some are in areas you would not expect. Even if you don't end up using Mathematica, these are instructive and have inspired me to think differently and quantitatively in new domains. Makes you understand where some of the WolframAlpha work is coming from. The premier professional Artificial Intelligence society, AAAI, has opened its digital library to the public.
' ... What is the life experience of the average human being? Other than that they are born and die, it gets pretty complicated. That's why we don't usually ask questions like this: we recognize a certain absurdity in the concept. And yet, lot's of absurd answers are available for less than insightful questions about shopping. For example, how long is the average shopping trip? This seems like a legitimate question. What you would love to see is a picture ID on any picture taken with your mobile cam. Even the ability, if it were reliable enough, to use it as a means to identify yourself to the phone itself. ReadWriteWeb describes this and a number of other augmented reality applications that use your phone to describe your close-by context. Have experimented with a number of these methods in retail environments. The need to take a shot is still too labor intensive for most shoppers. I want a device that will alert me to more useful detail in my close-by context, and points out things I may want to take a picture of. That could be based say on my search history. Or choices of areas of interest. With my permission of course. Always looking for easier ways to take aspects of the real world and turn it into manipulable models online. Here reviewed in DownloadSquad. A means of building a 3D model using digital photos. See 3DSee. Examining. More development under way that is worth following.
' ... Everything you always wanted to know about oil and gas prices, consumption, coal, hydro-electricity … (and more). Lots of data, nicely presented from a visualization theory point of view. BP also provides the data in Excel spreadsheets – quite generous ! Note also the interactive charting tool... '. From Wim Van De Velde. From the Communications of the ACM: Are We Losing Our Ability to Think Critically? I have been involved with the understanding of brick and mortar stores, and the utilization of online commerce. Now a way to design a brick wall of the future with mathematics. Building a wall is something that has proven very hard to automate, but help is on the way. At the right an example of a generated wavy brick wall. Dave Knox points out that Walmart does a good job organizing all their Twitter accounts in one place. It is here. I agree, most corporate examples are very haphazard.
' ... New Wharton research finds that 35% of shoppers have had an extraordinary -- or wow -- retail experience in the past six months. But in order to hit that mark, retailers must deliver on as many as 10 different elements of the shopping experience simultaneously. Retailers are rewarded when shoppers tell others about their experience. "Peoples' expectations are pretty high. It's easy to [fall short of those expectations], and hard to eclipse [bad experiences, even] with something that's over-the-top," says Wharton marketing professor Stephen Hoch. "Bitching and moaning is more common than praise." ... '.
' 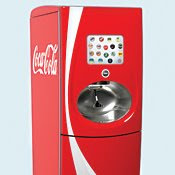 ... Coke plans to roll out the Freestyle drink dispenser nationwide, eventually putting tens of thousands of them in places such as McDonald's, Burger King, and Willy's Mexican Grill. And while the machine is taking the concept of customer choice to new heights, the most interesting aspect is the technology it's built on. Freestyle will become Coke's front-line robotic army for business intelligence, sending massive amounts of consumption data back to the beverage company's Atlanta headquarters. Had a most interesting conversation with Ken Karakotios. He demonstrated some of his prototype economic simulation models. He is looking for collaborators and funders for further developing the project. He also introduced me to his concept of crowdsourced simulation, which he describes in more detail in his blog. Recall all the poor results from recent economic models? Ken Writes: ' ... I propose addressing these challenges via crowdsourcing. That is, in the spirit of Wikipedia and open-source software, providing a platform on which many people can contribute to a model ... '. This saw much press yesterday, that a Carnegie Mellon professor has shown how using some fairly simple techniques social security numbers can in many cases be predicted, leading to increased potential for identity theft. It was pointed out that the Social Security Administration does not recommend using SSN's for personal identification. Gladwell in the New Yorker looks at the curious consequences of free: Priced to Sell, Is free the future?. Reviewing “Free: The Future of a Radical Price” by Chris Anderson. Have not read the Anderson book yet. Gladwell makes the case that ideas can be replicated 'freely' today, but not really at zero cost. The idea of 'free' has interesting psych effects on people (see Ariely), it creates nonlinear demand. Yet free is really only very low cost of distribution. Multiplying it by nonlinear demand creates high costs. Also some distributors like Amazon/Kindle are using this anomaly to load more costs into distribution so that the writers see less of the pay. So in the end who will be willing to write? Good overall report on business intelligence use. I have used a half dozen BI packages over the years. Several were used and then abandoned as needs changed. Plus the added complexity and cost of maintaining packages and cost: ' ... On-demand (or software as a service) solutions are particularly attractive to midmarket companies or enterprise departments that have limited budgets and limited IT resources. On-demand solutions are delivered as a monthly service, so they offer a low-risk opportunity to get BI without high costs, onerous commitments or high resource requirements ... '. Good piece in SASCom Magazine on how to link business process solving and analytics. This is the kind of thing that is rarely covered well in universities. You still have to adapt it to your own enterprise, but this is still a good start. A good overview of the state of WolframAlpha in MIT's TechnologyReview. I have taken a look at it and reviewed it several times since its release, previous posts here. The article gives much behind-the-scenes motivation. A recent look at WA does not change my view. A very good idea, still implemented quite incompletely. Would make sense to implement this as a part of a full classic search engine. Buyology Inc, an outgrowth and consulting extension of Martin Lindstrom's Neuromarketing work is now up and running. Their new web site has lots more information about the effort. I am involved and am enjoying it. From time to time I will covering their work in this space. Came upon an interesting book at the library. Libraries are still of value, they provide an alternate random encounter model for discovery. 1001 Inventions that Changed the World, by Jack Challenger. Bit of a coffee-table thing here, but worth a scan and sometimes a read. Disagreed with a few of the attributions, mainly because of differing views of what 'invented' means. Some of the many illustrations are not described completely. Yet is still worth a look for one view of invention and discovery. For many years my specialization in the enterprise was to optimize systems. We used many packages, up to including ones that dealt with very large problems of hundreds of thousands of variables. Problems like those need special techniques and fast computers. I have just been connected to some smaller problems and was reminded of a vendor called Lindo Systems, which we used in the enterprise many times. I am happy to endorse them, especially for small to medium size problems. They are well known for their Whats Best! system, which can be connected to Excel to solve both linear and non-linear problems. They have a number of other math programming packages to suit your needs. You can download any of their packages free and try them with limited problem sizes. Especially useful is their library of applications which looks at many kinds of solutions you can tailor to your problem. 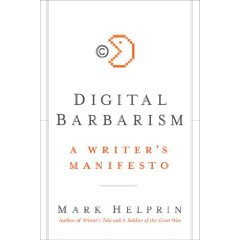 Reading Mark Helprin's Digital Barbarism: A Writer's Manifesto. A good contrast to previously reviewed The Public Domain: Enclosing the Commons of the Mind, by Peter Boyle. I have read a number of Helprin's novels and he takes the writers view here. How does profit from digital property differ from physical profit from digital property? Helprin writes 'novelistically' even when making a non-fiction point, while Boyle writes legally. I think that though Helprin makes good points about the theft of property, his arguments will not prevail in an increasingly shared property world. Good read. Bruce Hall on Neuromarketing. Makes the point that this adds to the existing rationally-directed methods, but not that NM can add a deeper and more complete dimension to understanding the consumer. The foundation of a good search engine optimization (SEO) strategy is a well thought-out keyword strategy. Unlike the instant gratification of pay-per-click advertising, organic search efforts often take six months or more to show results. During those six months, your business will be creating mountains of content and building targeted links, all focused on 5-10 specific keyword phrases. If you've targeted the wrong phrase – perhaps it was too competitive, or there wasn't enough traffic, or the traffic didn't convert – the wrong keyword strategy will have cost your business thousands of hours in wasted effort ... "
From Wharton's Knowledge Today, a view of alternate economic models: ' ... Chris Anderson, editor of Wired magazine, extols the market power of giving your product away in his new book, Free: The Future of a Radical Price. But another trend-spotting author, Malcolm Gladwell, pokes holes in the argument ... '. Having worked with the commercial Web from early on I am used to free. I can also see how this cheapening has caused some very useful experiments to fail. In IEEE Computer, Ubifit: Designing for Behavior Change in Everyday Life. I have seen a number of lab attempts at this basic idea, this one looks good. An interesting innovation consultancy group. ' ... Marco Polo Explorers is an innovation consultancy that transforms consumer insights, market intelligence and proven instinct into powerful new product and service ideas. This isn't ivory tower, pie in the sky brainstorming games, it's strategically disciplined digging for big ideas that drive top-line dollars ... '.